Well, it’s still cold, but the sun came out for a time here in Cornwall over Easter weekend. Of course, this is the weekend I get a streaming cold and cough palaver, and have no energy to go anywhere! Never mind – I had to go into Helston for some medicine, so rather than going back to crawl under my duvet at home straight away, I decided to go for a short walk through part of Penrose, near Helston. This is one of my favourite places in Cornwall, but normally I park in the National Trust car park about half way down the road to Porthleven, and make my way through the Penrose Estate down towards the sea (see my first ever post here on this blog about the wonderful Loe Bar!). But today I was only up for a short stroll, so I parked opposite the Boating Lake and had a wander through the Penrose Amenity Area. After a more open grassy area by the side of the Cober the way takes you into wet willow woodland, full of the signs of spring. There are so many small winding paths, I found myself meandering about happily without getting very far at all, as I kept doubling back on myself, attracted by this flower or those steps or that clump of fungi, or meeting and greeting friendly dogs and their owners. The runny nose and sore throat was almost forgotten! Looking like its own name – navelwort. Just five miles from Newquay. Enjoyed by surfers and dog walkers and those wanting an uncrowded beach walk. Worth a visit. No toilets or cafe. That’s the kind of information you get if you do an internet search for Polly Joke. To say that this is underestimating the call and stark beauty of this small Cornish beach is itself an understatement. I visited a couple of weeks ago with two good friends, one of whom had been visiting the beach since a child, and the other for many years, whereas for me it was my first time. And yet for each of us there were new things to find, fresh wonders to experience, a sense of apartness from the stresses of everyday life. We parked in the small National Trust car park nearby (turn off the road at the sign for Treago Farm), or you can park at West Pentire, a mile away. The National Trust owns the land around the bay, Cubert Common, which definitely sounds worth a ‘spring flower’ explore. But for now, on a brisk early-year day, you should go through the gate and head down the river valley towards the beach. 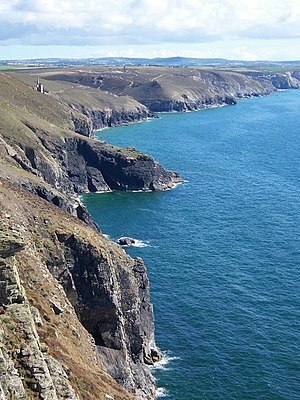 Polly Joke is derived from Porth Joke. A Google search turns up that ‘Joke’ either means ‘chough’ or, and perhaps more likely, that the name comes from the old Cornish words for Jackdaw Cove – Pol-Lejouack. We didn’t see either of these corvids – choughs (not likely!) or jackdaws (more possible) – but we saw plenty else. You do in fact have to look hard. Isn’t it amazing how many creatures have adapted to merge into the background as much as possible. You have to be pretty alert and able to look beyond the “obvious” to see what is really lying there before your eyes. Literally lying there, in the case of one immature seal. Or rock. Until it hmmphed and lifted its back flippers to us. Definitely a seal. We also had to work hard to spot this bird hacking away at mussels on a rock. None of us being experienced birders, we only sorted later that it was a Turnstone. Can you spot it? And what about the surfing seal of the title of this post? Ecological ‘received wisdom’ is that animals do nothing energetic that isn’t focussed on survival gain. And yet we do find animals doing things for no obvious reason. For quite a while we watched an adult seal surfing, seeking out the decent waves, riding them into shore, and then repeating the show over and over again. One of us had in fact been there the day before, surfing alongside (probably) the same seal. It was hard to believe the seal was doing this for any reason other than sheer delighted fun. We ourselves had a bit of fun with a kestrel, that swooped over our heads and then hid itself in the cliff side. Poised with cameras, we waited for it to take off again, dreaming of an amazing in-flight shot. Not to be! It took off before we were ready, but we still enjoyed the drama and grace as it soared away. Here’s a rather fuzzy shot of it watching us from the cliffs. The beach itself is sandy, full of shells and small stones. Caves beckon, and ripples in the sand lead you on towards the northern Cornish sea. I studied geology a few years ago, and one of the things I loved best was to find evidence of old beaches in the geological record – shell lines in rock faces, ripples preserved in rocks, cross-bedding reflecting the ebb and flow of tides. Here at Polly Joke those sand ripples are here and now – no different in form from those we can examine in rocks from millennia ago. We cannot escape our connection with the past – we are part of it, and it has structured our very being. Do not ever think we are separate from nature. It was then, it is now, and it is our future. We are as much a part of it as is the seal, the turnstone, the kestrel, the sea and the sand. At Polly Joke, or Porth Joke, the Bay of the Jackdaw, or wherever, we are called to remember that. In my last post, I talked about the two species of seahorses – Short-snouted and Spiny seahorses – we can find around our shores, including here in Cornwall. This cryptic creature is hard to find, but I like to think of it, nestling among the seagrass and seaweed in its salty water world, safe from human disturbance in a world set apart from the hustle and bustle of life on land. If only that were true. The reach of us humans has extended everywhere across this globe, from the upper levels of the atmosphere to the bottom of the oceans in far-flung places. So, it has certainly reached our local seas. Seahorses, as fish highly sensitive to environmental disturbance and change, are a good ‘barometer’ of wider adverse impacts. Dredging and anchorages, when not managed sensitively, can destroy the seagrass beds and other habitats they rely on; and, like many mobile sea creatures, and in the same way as we are seeing on the crowded land, they suffer from a loss of connectivity between habitats and breeding sites. Cornwall is a maritime county. Cornish people work on the sea, enjoy surfing on it, walking along the strand or cliffs, swimming in the water (in summer! 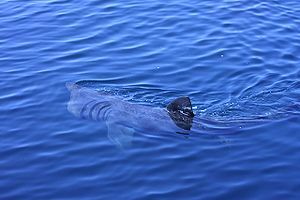 ), spotting basking sharks and dolphins, rockpooling, and much much more. We need to protect our seas – they are part of our heritage, livelihoods and culture – but it’s not all serious: there are plenty of things that are fun to get involved with, but which also help in preserving our shores and seas. Here are a few to think about. If you’re a recreational diver, trained to a level of BSAC Sports Diver or PADI Rescue Diver, then you could get involved in Seasearch, and help in marine surveys. Go rock pooling! CWT are organising a half-term rockpool ramble at West Looe on 16 February at 2pm. Check out their other events for some great and informative days out. 2. You could join The Seahorse Trust. You can adopt a seahorse though the Trust, as well. Have a look at their great website for lots of information about seahorses and the threats they are facing. It is both packed with facts and links to survey and scientific work as well as great photos. 3. Are you a surfer? Surfers Against Sewage is a national charity, but it started its life in Cornwall with a group of surfers and beach-lovers in St. Agnes and Porthtowan. They have plenty of ways to get involved: check out their Facebook page. 4. Other local organisations, such as the RSPB and National Trust will have marine-related volunteering opportunities. You could become a Hayle Estuary Litter Picker with the RSPB – it may not sound immediately inviting! – but done in a crowd it can be great fun meeting like-minded people and doing your bit to keep beaches clean for wildlife and us to enjoy. 5. You could resolve to learn about a particular marine species, or group of species. I really enjoyed learning more about seahorses – basking sharks are next on my list! Then join or help out an organisation that campaigns for them, such as The Seahorse Trust, or Marine Conservation Society. 6. Make sure you only eat responsibly and sustainably sourced fish – this supports local fishing businesses, as well as being ethical and tastier. 7. Respond to the DEFRA consultation on Marine Conservation Zones (check out my post from a few weeks ago – and here’s the link again). There are lots of different people and interests involved, and it is very important the outcome is sustainable for the local economy as well as wildlife, so the solutions are not straightforward. Many nature organisations are however disappointed with the Government’s position and, whatever your views, the consultation is a good opportunity to make them known. Or write to your MP. Well, that’s a few ideas, and there will be lots I have missed out. If you have any ideas you’d like to share, please leave a comment here or on the What’s Wild in Cornwall Facebook page, and spread the word! I’ve been heard to express doubt about whether wildlife NGOs work together often enough. Acting in partnership gives not only strength in numbers and clout, but means that people and organisations, both at local and national levels, get to share views, good practice and ideas. So I’m always glad when I’m forced to eat my words on this point. A great example where I’m proved wrong in Cornwall is the “Linking the Lizard” project. Part of Cornwall Wildlife Trust‘s Living Landscapes initiative, the Trust is working in partnership with the National Farmers Union, Natural England, the National Trust, and Cornwall Area of Outstanding National Beauty to deliver changes across the landscape that will benefit both wildlife and those who live and work there on the land and sea by supporting sustainable business, agriculture and tourism. Wildlife will gain from those involved being able to work across boundaries to link habitats and species. I’ll be watching the project develop with interest! Nationally, it’s also good to see the NGOs speaking out together on issues. The RSPB, Wildlife Trusts and Institute of European Environmental Policy have recently written to the Prime Minister urging him to push for wise spending on environmental policies. They’ve told him the key is not more expenditure, but in a time of economic austerity, to target it in the most effective way, to improve the environment for all EU citizens. It’s very powerful when wildlife NGOs and an independent policy thinktank speak out together – let’s hope Mr. Cameron listens. Yesterday, I should have been staying at home doing some work, but the sun was shining, and what’s a person to do! I decided to explore somewhere new but not too far, so I threw my walking boots in the car and headed off to St. Agnes on the north coast. First I negotiated the one-way system in the village, stopped off at a local shop for crisps and chocolate, and then drove to near St. Agnes Head, parked, pulled on several layers of clothing and set off on the South West Coast Path. The view was stunning, the sea a beautiful greeney-blue, and the path stony but level-ish. I quickly arrived at the intriguingly named Tubby’s Head, and sat for a few moments on a bench, in the seat of which there was fixed a small brass plaque: “June Claydon, Resting in Peace by the Sea, July 1992“. I wondered who June was. I thought of her, maybe sitting on this bench in this same spot, doing pretty much the same as me, gazing out to sea and enjoying the crisp air on her skin. It is wonderful how you can be touched by the life of someone you know nothing about, simply because you occupy the same space, maybe feeling similar things, albeit in a different time. You may already have noticed a discrepancy between the heading of this post and my reference to the sun in the opening paragraph. Well, by this, paragraph 4, the discrepancy disappears. Yes, from this point it started to drizzle, though it fortunately never became a downpour! Never mind, I continued on to admire the industrial archaeology of the Wheal Coates Tin Mine and Towanroath mine engine house, and then on to join the dog walkers and their happy dogs on Chapel Porth Beach. After this I turned inland up Chapel Coombe, walking through woods on a muddy path alongside a stream. The sea was forgotten, and I was in a world of trees, farmland and woodland birds until, emerging on to an upward track, I finally reached the top of St. Agnes Beacon. What a view! Wet and cold, but still…The heathland here is an important habitat, looked after by the National Trust. 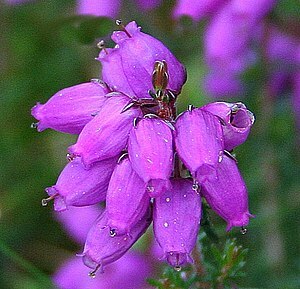 I was a little late in the year for the full heather display, but some Bell Heather was still flowering, its purple contrasting with the vibrant yellow gorse. A bird of prey hovered – what did it see? A vole or mouse (prey)? A pile of stones on top of the hill, meaningless to it? A wet human (not particularly interesting to your average raptor!)? After this, the weather was getting the better of me, so I headed back to the coast, enjoying the (very distant!) sun shining through breaks in the clouds lighting up the horizon, and then walked along the cliffs and back to my car. As I drove home, I thought again about June Claydon. I’d like to think that, when my time comes, Cornwall will be enough my home, and enough people will think well of me, that there will be a bench here for me, too. You can find a similar walk to mine, plus others, at The St. Agnes Forum Website. And I’d love to hear from anyone who knows who June Claydon was.